Want to Reduce Your Risk of Getting Cancer? Here’s a fact only half of Americans know: Obesity raises your risk of cancer. In fact, being overweight boosts your chances of developing at least 10 types of cancer, according to the American Institute for Cancer Research (AICR). The group says that after not smoking, maintaining a healthy weight is the second most important thing you can do to prevent cancer. Have you weighed yourself lately? Dropping even a few pounds could make a difference. “If every adult reduced their Body Mass Index by one percent, which would be equivalent to a weight loss of roughly 2.2 pounds for an adult of average weight, this would prevent the increase in the number of cancer cases and actually result in the avoidance of about 100,000 new cases of cancer,” the National Cancer Institute notes on its website. The American Cancer Society (ACS) estimates every one in five cancer deaths in the United States is linked to body weight. The timing of your weight gain appears to matter. For example, being overweight as a child or young adult might be more of a risk factor for some cancers than gaining weight later in life, according to the ACS. And excess weight seems to be linked with an increased risk of breast cancer in women after menopause but not before. 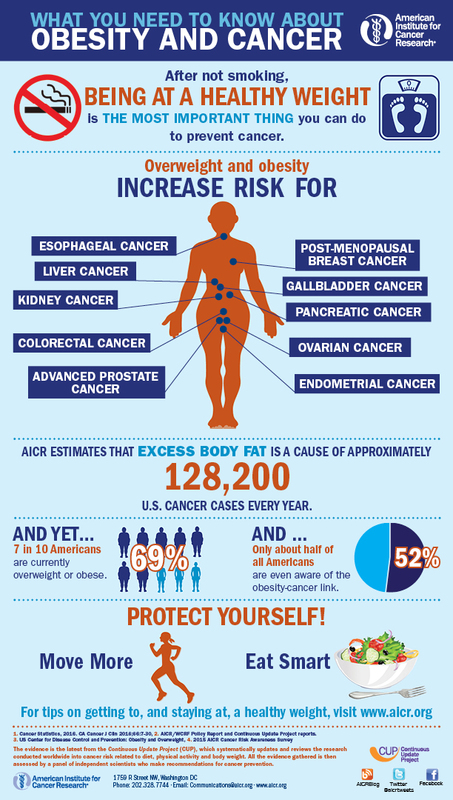 Read more about the obesity-cancer link and about how to protect yourself in this infographic from the AICR. PrevIs It the Flu or a Cold?